Everything that you will read below were based from my experience. As of this time of writing, all procedures & requirements are accurate; unless otherwise stated. It’s still best to contact the embassy for current information & to answer all your inquiries. After bidding for my service incentive leave, I have decided that I’ll spend my vacation in Seoul. I bid back in October 2015, and when we got our final date for SIL a month after, I started to prepare the requirements for my Korean tourist visa. Aside from my payroll account, I opened my savings account with BDO because it’s the nearest bank to my house, and their ATMs are almost everywhere. After 7 months from opening my savings account, I went to the branch where I opened my account and asked for a bank certificate & bank statement for the last 3 months. Good thing with BDO is that they are very much familiar with the required format of the Korean embassy. Aside from bank statement, you may prefer to use your passbook. I have a passbook, but I opted for the printed bank statement. You just have to pay Php 100 for bank certificate & Php 100 for bank statement. You may claim it a day after you made a request. I got these from our HR. The certificate of employment must have the ff: position in the company, date hired, monthly or annual salary, active contact details of the HR person who will sign your COE. As for the ITR it must be the latest issued to you. I got those after 3 working days from the day I requested. You may print the form available at the website of the Korean embassy. Type or hand-written is acceptable. Don’t leave blanks, just type N.A. or not applicable. Attach the passport-size picture with white background on the application form. Your passport must have a validity of 6 months or more on the planned days of your vacation. I went to the Korean Embassy in McKinley Hill at 9am. I waited for my queue for half an hour and when it was my turn I just submitted it on the window counter. They got all my documents and passport & gave me a claim receipt. I must return on June 20, 2016, or after 5 working days, to get my passport. No questons were asked to me. I returned to the embassy to claim our passports at 1pm, and it’s stamped with tourist visa valid for 3 months from June 20 till Sept 20, 2016. It’s free and you’re allowed to stay for 59 days. All documents must be original. No specific amount was mentioned on how much your bank account should have on the time of the application. As long as your account is active & could support the whole duration of your stay in Korea, then it’s acceptable, I guess. You can submit someone else’s application form & documents. No need for personal appearance. We both got our tourist visas after 5 working days & hassle free! Our travel in Seoul, South Korea is another achievement unlocked. First, we did not exceed our set budget. Second, locals hardly speak English, but we managed. From getting lost and asking directions to eating unfamiliar local dishes. The language barrier is difficult, yet I have seen their efforts to help us. On the positive note, the country is safe, and you can wander all you want. A flight to Seoul from Manila is almost 4 hours via Incheon. You may opt to travel with any of our local carriers, Cebu Pacific, Philippine Airlines, and AirAsia. 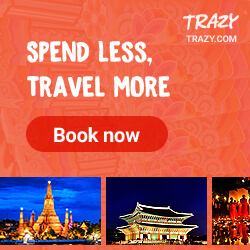 You may also choose to take Korean Air, Asiana, etc. We have flown with Cebu Pacific (to avail my airline benefit) scheduled to depart at past 3 in the afternoon, and arriving at around 8pm (Korea local time). Seoul is 1 hour ahead of Manila. After passing thru immigration, I claimed our reserved wifi kit at the arrival hall in between gates 6 and 7. I made the reservation online through KT Mobile Rental. I gave a deposit of 200000KRW, and will deduct the 27500KRW for my 5-day use. Upon returning on our last day, I got my 172500KRW deposit. When I made the reservation online, I found a discount coupon- so this rate is already discounted. Seoul City is 45 mins away from Incheon International Airport, and to go to the city, it’s best to take the subway. I would love to try the Airport Express Train, but when we got there it was already closed. Instead, we took the other train, which stops in every station. It’s way cheaper, but the time difference is only 10 mins. Our hostel, New Sun Guesthouse is a 5 min. walk from Hoehyeon Station. Its location is very strategic- 5 mins away from Myeongdong and 10-15 mins from Seoul City by foot! I booked our hostel thru Airbnb app for only PHP6685 good for 4 nights and 2 persons. We have our daily complimentary breakfast and bottled water, basic toiletries, and free wifi. Tip: Ask the frontdesk officer for package tours if you don’t have an itinerary yet. They offer good deals. 16 degrees Celsius upon arrival. OOTN: Hers- white top from Zara, black pants from River Island, boots from Moschino, bag from DKNY. His- pink polo from American Eagle, black slacks, black Nike roshe run sneakers. On the night we arrived, we walked around and we reached the Namdaemun Market. We were looking for a place to eat but we cannot really decide because there was no English translation, and no one speaks English. We took a chance at this small eatery along the street and ordered barbecue and some ramen. The lady in her 50s probably, gave us free unlimited rice cakes mixed in curry, and a scrambled egg mixed with spinach. It was such a sweet gesture, appreciated by lost and hungry tourists. I love the food, but spicy is not my thing. Menu in Korean. We choose our food based from pictures. Korean chicken barbecue for 15000KRW. After having our hearty breakfast, we took the train going to Gyeongbokgung Palace. There were also other palaces in the city, but we chose this because it’s the main attraction. On my next visit, I will visit Changdeokgung Palace during autumn. We availed the free 1 hour English tour to understand more of the palace’s history, and its dynasty. At the entrance stands the Joseon guards, however we did not witness the “Changing of the Guards” ceremony. Gyeongbokgung Palace in the heart of the city. Our English speaking tour guide. Tip: Check the schedules of the palace tour. Available in English, Japanese and Chinese. It’s free. The king’s chair during ceremonial parades. Ancient artifacts from the Joseon dynasty. It’s a street composed of traditional Korean houses. It’s their version of the “old rich” houses. Visitors may enter some houses and experience tea-time with a fee on it. Some houses were converted to cafes. You need the strength to go up. A tourist strolling the area in Hanbok. I arranged reservations for our out-of-town tour to avoid the hassle of getting lost via Funtastic Korea. I highly recommend that you avail their package. As compared to DIY tour vs. package tour, the difference is very little. You just have to pay a little for your convenience and comfort. I made the payment online before we left Manila. Package tour includes Nami Island, Petite France and N Seoul Tower, pick-up and drop off service to your hotel, and lunch at Mr. Dakgalbi. Our tour was on a Friday, and to my surprise, we were the only guests for that day. Lucky day indeed! The van is exclusive to us. It’s the famous island from the Korean series Endless Love: Winter Sonata. There are two ways to get into the island, first is through a ferry ride and second is through a zipline. They say that it’s best to visit Nami Island during the autumn because the lush green forest turns into bright orange. The island itself is picturesque, romantic, and is highly appreciated by nature lovers. You may wish to walk or bike around but for a fee. Pay your entrance fee here. 5 min. ferry ride that will take you to Nami Island. You may opt to take the zipline going to Nami Island. Somewhere behind is the tomb of Gen. Nami, whereas the island was named after him. OOTD: Hers- black turtle neck dress from Cotton On, scarf from Cotton On and sunglasses from Prada. His- black shirt from Nike, jeans from Uniqlo and sunglasses from Rayban. Winter Sonata’s first kiss took here. You say “welcome” in different languages. An attempt to copy their pose. This is a Korean restaurant located near the parking area for Nami Island visitors. Feel free to eat the Korean chicken barbecue in a traditional way. The lunch is part of our packaged tour. Located 20 mins. away from Nami Island, the place is dedicated to the author of the novel, The Little Prince. It’s very artsy fartsy, and I could appreciate the place because I have read the novel. The Korean series The Secret Garden was also filmed in here. If you love Korean series, you will be very familiar with the place. We drove again for around an hour to get back into the city, and visit the N Seoul Tower. It is located in the Namsan Mountain, and the N Seoul Tower is the highest point around Seoul at 236m. We got a chance to look at Seoul from the bird’s eye view. Before going up at the observatory deck, you will pass by the famous love locks of Seoul. We did not have a padlock with us, and buying from souvenir shops is quite expensive, so we just ended up posing with the locks around. Love locks from visitors all over the world. A bird’s eye vew of the city. Dubbed as the most dangerous border in the world, yet it did not stop me from marking this off on my bucket list. This special place could only be accessed through special permission, and thankfully DMZ Tours exist. Based from what I have read, DMZ Tour on Saturday is provided only by a single agency. I availed the weekend package through KTB Tour and with a brave heart and soul, we visited the most dangerous border in the world. It felt like a field trip on our way in there. We belong to the English speaking group and only 5 are Filipinos including us. A tour guide explained well to us the history of the Korean War, and I was very eager to listen along with some people who seemed to be journalists, professors, historians, etc. The tour includes visit at the DMZ, JSA, Freedom Bridge, and a sumptuous lunch. The brown building is part of North Korea already. JSA or Joint Security Area is the blue building where important meetings are held by the United Nations and the two Koreas. It’s literally divided into half, one from the North side, and the other from the South. It is here where treaties have been signed and has played a role in the Korean history. From the outside, you will see the building of North Korea. Picture taking is limited to two mins and limited to some areas only. Inside the joint security area where important meetings are held and treaties were signed. Many are still hoping for a unified Korea. Aside from the DMZ Tour on that day, we also had a chance to visit Lotte World. I got discounted tickets from our hostel’s front desk. It was 5pm already when we got in there, and since it’s a weekend it’s packed with foreigners and locals alike. Most rides have ridiculous lines, and I don’t want to waste our time from lining up. We ended up riding the bump cars, and kid-friendly rides. We were also just in time for the parade of Zombie characters. Let them read your destiny. A zombie parade in the background. OOTD: Hers- black polo shirt from American Eagle. His- black polo shirt from Cotton On. Every night of every day, we never failed to pass by Myeongdong district. It is the haven of people who love cosmetics like me. They sell Korean cosmetics at a very low price compared to the prices in Manila. Definitely a place that I will always comeback to. Street foods are sold here too, and it never failed to suffice my cravings. At the end of our mini vacation, I could assure you that I cannot handle spicy food well. No matter how good the food is. I love their street food but if you’ll convert it to Peso, it’s a bit pricey. Shopping for cosmetics is heaven in Korea. You get to buy the best for an affordable price. I will absolutely comeback to explore other places and try out more authentic Korean food during the autumn season. Do not forget to buy souvenirs. Almond peanut is my favorite, and it’s cheaper in Myeongdong. These little goodies were freebies from my purchases. For the trip, our total expenses was PHP44138 all in except shopping. In traditional Hanbok, Korea’s national costume. For itinerary, directions, food places and budget, feel free to click the Itinerary: Seoul 2016 link.